Variety Bandbox was a programme originally devised with the specific aim of entertaining British armed forces personnel serving overseas. It was first broadcast in February 1944 and was transmitted on Sunday evenings in the early 1950s. 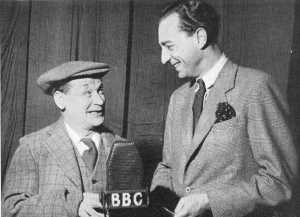 The programme introduced new acts to radio and was hosted by Philip Slessor (right). A series within a series called 'Blessem Hall' was broadcast every other week from March 1950 as part of the programme. Peter Sellers played Major Manoeuvre the Manager, Giuseppe Chipolata the waiter and Erbert Perks the Night Porter whilst Miriam Karlin played Mrs. Bucket the Benevolent Char, Mrs. Snitchlepuffle a guest and refugee and the "refained" Receptionist. 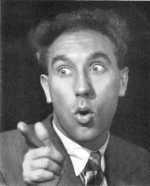 Derek Roy, Max Wall, Reg Dixon and Frankie Howerd were regulars, as was ex-painter and decorator Arthur English who played the resident comedian and Prince of The Wide Boys. His catchphrase was 'Play the music, Open the cage!' - a meaningless piece of jumble he came out with one night and which stuck. Frankie Howerd's first radio broadcast was as a comedian on this show where he coined his catchphrases "Ladies and Gentle-men" and "Ye may Titter. Titter ye may". Frankie's act usually mentioned that mistress of the pianoforte, Madame Vere Roper and also Madame Blanche Moore, also known as Minnie.